Teacher Only Day tomorrow and teachers will be gathering in Alexandra from all Catholic schools across the Diocese to celebrate Mass and attend workshops. A big day but a wonderful opportunity in making connections with each other, across schools and what Catholic Schools are about. On September 21st, the Church celebrates the Feast of St Matthew, Apostle and Evangelist. In 1953 on this feast day, the young Jorge Bergoglio, now Pope Francis, experienced God in his life in a “very special and intimate way. He felt his heart touched by the mercy of God. In memory of this event Francis chose as his episcopal, and later papal motto, the words , “Miserando atque eligendo” from Saint Bede’s homily on the calling of St Matthew. Through history men and women have died for their faith in Christ. 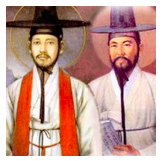 Two such men were Andrew Kim Tea-gon and Paul Chong Ha-sang. Along with their companions they were killed in one of the many Christian persecutions in the 19th Century. Christianity spread throughout the world but it was and is easy to be Christian, even today, in many parts of the world.